When I first started working with the CityGrid Places API, I built my Hyp3rl0cal project, which is a basic business directory, with versions in PHP, Python and Ruby. While building Hyp3rL0cal I wanted to show as much of the data returned from the CityGrid Places API search and detail. So both the listings and detail page are pretty bland and just show what gets returned from the places API. I just finished my second WordPress plugin, and the listing and detail pages need to look better. 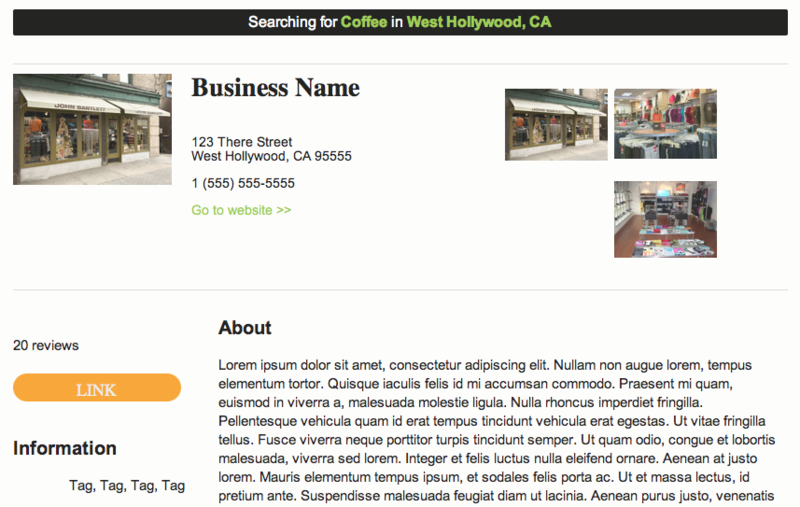 So I created the first template for business listings and detail page. I “borrowed” the HTML / CSS “look and feel” from the new CityGrid search engine. I cleaned it up, generalized it and published to Github for forking or download. Your welcome to download and use in your own applications. It should be pretty straightforward to deploy. I will be offering it as a template option for both the CityGrid WordPress Directory Plugin and the CityGrid WordPress City Search Plugin. I am going to build other templates, hopefully coming up with a lot of different configurations. Let me know if you have a template you’d like to share.